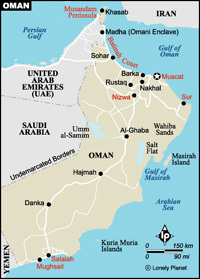 Oman occupies the eastern corner of the Arabian Peninsula, bordered by the United Arab Emirates (UAE) to the north-west, Saudi Arabia to the west and Yemen to the south-west. Oman's diverse geography includes rugged coasts, placid beaches, craggy mountains, salt flats, oases and deserts. The northern coastal strip along the Gulf of Oman is known as the Batinah coast, a sand and gravel plain separated from the rest of the country by the Hajar Mountains. The highest peak is Jebel Akhdar ('green mountain') at 2980m (9775ft). Oman also has two large areas of salt flats, one in the central west and another opposite Massirah Island, off the eastern coast, and just south of the popular Wahiba Sands desert area. Much attention has been devoted to the country's plant life: coastal areas are preserved and there are National Protected Areas scattered around the country.